Are you the type who gets nostalgic over Hollywood in its heyday? Do the likes of Alfred Hitchcock, Frank Capra, or Charlie Chaplain stir your soul with endless delight? Wait, does anyone know about this passion of yours?? 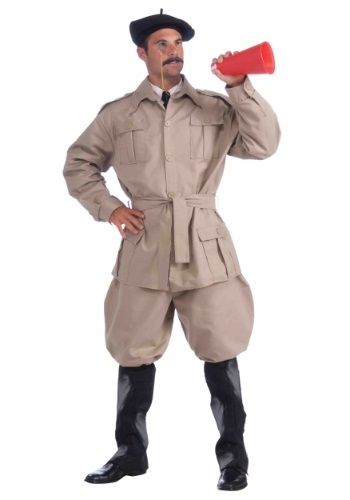 Never mind, that’s not important right now…If your mind is always abuzz with the latest blockbusters or timeless classics, it might be time to yell “action,” and claim this director costume for yourself. Directors are visionaries. They have incredible talent that transforms words from a script to an art form with actors, scenes and music, which can be watched and enjoyed for generations. Your friends will recognize your talents in choosing a costume that embodies your passion for motion pictures and the genius minds behind them. Another perk we haven’t even mentioned yet is that this is your big chance to wear a pair of Jodhpur-style pants. First worn by Indian polo players, British equestrians and military personnel—they eventually caught the eye of American movie stars and directors. This iconic style features excess material at the hips and thighs for ultimate comfort. So what does that mean for you? Just like directors of yore, you can stand from a seated position and yell, “cut!” at a moments notice. Now that’s golden! Whether you are a modern day Spielberg, a budding digital amateur, or classic film aficionado, you can at least look the part.